PPGpS uses your smartphone's GPS. Make sure you have enabled the GPS in your smartphone settings. Google Map requires an internet connection. The live tracking feature requires an internet connection. Sending SMS requires GSM connectivity. FlyNet2 and Flight Bandit devices require a Bluetooth connection. PPGpS is preconfigured in order to be used out of the box. The first GPS fix may take several seconds. The long blue beam represents the Actual Bearing... that is where you are actually going. Short blue beams represent Average Speeds by azimuth . As soon as you have flown a few seconds heading in a new direction, a blue beam is drawn in that direction. The longer the beam, the faster the average speed is in that direction. Red triangle shows Wind direction. Blue triangle shows the actual orientation of your smartphone on the map. It may be slighltly different from the Actual Bearing in case of lateral wind. All the instruments are described in the next chapter. Heading to the takeoff location. Estimated time to return home. After landing (which is auto detected), the flight is recorded in a Google Earth compatilble KML file. The list of all recorded flights is available with the Tracks menu. Instruments units of measure should be set in the Settings / Unit of measure menu. Short click on the instrument to switch to the next mode. Long click on the instrument to reset the maximum G value to 1. In degrees (0-360) relative to magnetic north. GPS altitude is based on the WGS84 system and may be inacurate. Click on the instrument to switch to the next mode. Click on the instrument to select a waypoint among the list of all waypoints. See Waypoint management chapter for more information. Traveled Distance since last takeoff. This information will be recorded in the KML track file. Elapsed time since last takeoff. This information will be recorded in the KML track file. Computed sunset time, based on your current location and date. It is available afer you have been located. Remaining fuel quantity and estimated remaining flight time are displayed in the gauge. Click on the instrument to input the actual quantity in the tank before takeoff. Fuel consumption parameters are available in the menu Settings / PPG preferences. Consumption setting is fully described in the Fuel chapter. At any time you can set an altimeter offset. Press on the ALT instrument during a couple of seconds to display the altimeter settings form. 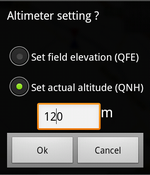 Choose QFE to set the altimeter to zero. In this case, the altimeter will display the elevation on top of the field. Or, choose QNH and enter manually the actual altitude. In this case the altimeter will display the actual altitude. Use the menu Waypoints / Add on map. A message "Tap on screen to create the waypoint" is displayed. Slide the map to where you want to add a waypoint. Tap once quickly on the map to create the waypoint. An icon is drawn on the map to represent the waypoint. The message "Waypoint successfully added" is displayed with its coordinates. The new waypoint is not automatically selected. Click on the WPT instrument to display the waypoint list. Use menu Waypoints / Add coordinates. Enter the Latitude and Longitude (decimal format is required). Waypoint preparation can be done from Google Earth on your desktop computer, before the flight. Numerous web sites explain how to proceed. Once the KML file with your waypoints has been prepared, copy it on the PPGpS folder of your smartphone. Use menu Waypoints / Import from file. The KML file list is displayed. Click on the file to be imported. The message "Waypoints successfully imported" is displayed. Waypoints are drawn on the map and you may select one of them from the waypoint list which is available while clicking on the WPT instrument. The route is made up of all waypoints. It is drawn by a yellow line. 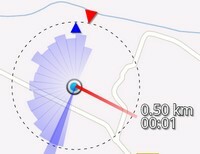 A red circle is drawn around the waypoints to show up the 250 meters detection zone. A green circleis drawn around the active waypoint. Entering into the proximity zone will trigger the automatic selection of the next waypoint (if available). A click on the WPT instruments reveals the waypoint list. Waypoints may be automatically restored when the application starts. 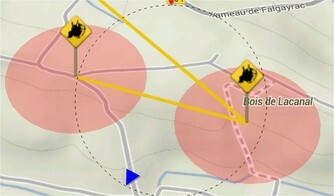 Waypoints may be automatically saved when the application stops. This behaviour is configurable in the Settings / Waypoints parameters menu. Press on a waypoint for a couple of seconds to display the waypoint menu. Select any waypoint in the waypoint list. Long press on the item to display the context menu. Type in the new waypoint's name and validate. Fuel consumption is estimated according to several parameters that you should set up in the Settings / PPG settings menu. Input the default fuel quantity that you want the application to set up everytime the application is started. You can adjust this quantity before taking off by clicking on the fuel gauge instrument at any time. Input the average consumption of your motor. Consumption computation will be done according to this parameter. Set the minimum fuel quantity before warning. Once the threshold is reached, the gauge instrument will turn to red to warn you..
During the flight, ground speed samples are recorded. Average speeds per sectors are computed and the wind direction is estimated. Wind direction is represented by a red arrow. The Wind reset menu allows you to clear all average speeds in order to restart speeds sampling and wind direction estimation. Use this function when your cruise altitude has changed, or when you want to estimate wind direction locally before landing. don't turn too tight in order to give time to the application for gathering speed samples at every bearing. After landing, your flight will have been recorded in a file. KML, GPX and IGC format are currently available. Files are stored in the /PPGpS folder of the smartphone internal SD Card. These files may be copied on your computer via USB connection. The Tracks menu gives you the list of all the recorded log files. Long press on a file name to display the context menu. Select Send or Share to export your file (E-mail, Bluetooth, Google +, ..). You will then be able to share your flights with your friends and familly with Google Earth or any other IGC/KML compatible software. Shows your track on a map. Delete the log file. Be carefull, the file cannot be restored. If you wish to use PPGpS in flight without any internet connection, you will have to prepare your maps before flying. Click on the Maps menu to display you offline maps. Press on + the menu bar to start the built-in offline map generator. Input the name of the offline map you want to create. Select the zoom levels you need but keep in mind that big maps with a lot of zoom levels may take a very long time to be downloaded and will generate a huge zip file. Select the map provider you want to download from and click on the map to set the upper left and bottom right corners of the zone you want to download. Start to download and be patient. In case a connection error occurs, relauch the download. Tiles are kept in a cache. A zip file containing all the tiles will be generated in the maps folder. You will not need to select a particular map file in your list because PPGpS will explore all the files to find the relevant pictures according to your location. The SOS feature enables you to send quickly send an SMS. The content text may be typed in advance from the Settings / Flight settings / SOS default message menu. So, you will not need to input it from the field where you've just made your emergency landing. You just need to select phone numbers from your contact list and wait to be rescued. This feature is only available if your actual location was acquired by the GPS. The Settings / Flight settings / Live tracking menu allows you to activate the live tracking feature. During the flight, your actual location will be sent to the PPGpS web server. This feature requires an internet connection. The update frequency may be adjusted in the Settings / Flight settings / Tracking update frequency menu. The Settings menu gives you the possibility to set the parameters of the software according to your needs. Several categories of parameters are available. Each parameter is briefly described with a small text under the menu itself. PPGpS is compatible with ASI FlyNet2 and Flight Bandit variometer. Bluetooth is enabled on your smartphone and Flynet2 module is already paired. Use menu Settings / System settings / Bluetooth variometer settings. Use menu Settings / Instrument settings / Variometer data. Select FlyNet2 or Flight Bandit data provider. Press on the variometer instrument during a couple of seconds (Vz). Use menu FlyNet2 or Flight Bandit. In case these menus are not enabled, please check that you have performed the configuration steps, as described above.